Have you written a fiction or nonfiction book that has music at its core? Are you now looking for an appropriate publisher for your book? 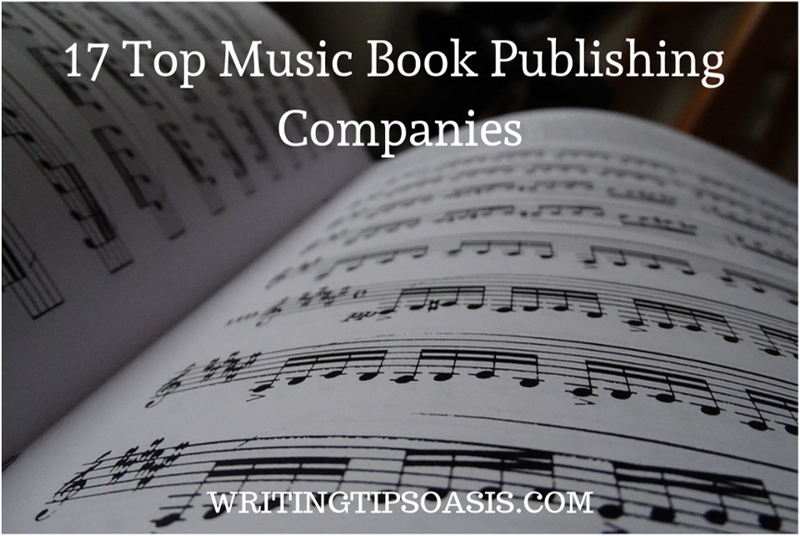 Continue reading to find out about 17 top music book publishing companies. Musical fiction is a rare, unexplored genre. Stories based in a musical world or revolving around music are given a chance to be published at Coral Press. People have a deep connection to music and songs. Writing a story around it can let them be a part of that world and enjoy it in a much deeper manner. Located in New York, they are an exclusive publisher of musical fiction. If your story involves music or a musical setting or a fiction around a real song, then this is the publisher you should be looking for. Novels or books about jazz, blues, soul, pop music and rock are currently being considered. Write a query letter and send it via email. Since 1987, Interlink Publishing has been actively promoting and supporting writers in fiction, non-fiction and children’s books. The Massachusetts based publisher prints 50 books annually. The publishing company has 5 imprints under its name- Interlink Books, Codagan Guides, Olive Branch Press, Clockroot Books and Crocodile Books. They request you to familiarize yourself with their work before you consider submitting a manuscript. Writers of art, cookbooks, travel, film studies, literature, history, foreign languages and music can submit a query letter. Write the query letter in the body of the email and the manuscript should be attached as a PDF, RTF or DOC file. The address and further guidelines can be found on this page. Situated in Chicago, Gia Publications has been printing and publishing church music, choral music and musical education materials. Musical editions involving scores and sheets are also published by them. Previously known as Gregorian Institute of America, they believe in the Christian faith. Materials, music and ideas that boost and pay homage to the faith are accepted and welcomed. They only want original score or materials. Music education means early development tools, instructional books and guide books for various instruments. Writers looking to submit materials or manuscript can only send a hard copy. The postal address, guidelines and instructions are mentioned on this page. A boutique publishing company established in 1972, Pendragon chooses quality over quantity. It prints books on all aspects of music, musical education, music theory and history. From the early centuries to 2019, music has evolved in a way that not many of us could predict or know. Books on the opera, aesthetics, American music and musicians, diversity in music, French music, Social history and theory of music are just some books they have printed. Writers, researchers, educators or musicians can write well researched, fact based books and guide books for them. Writers interested in submitting a manuscript to the New York based publisher can do so after reading the guidelines. From 2006, this small and independent publisher has worked effortlessly to support literary talent. Being a boutique publisher means they can give writers individual focus and support that makes them feel cherished and respected. Michael Linnard and Tamara Martin are the brains behind Little Red Tree. Michael was a song writer and musician who wrote several songs in United Kingdom. Tamara is a multi-talented person who worked as a teacher, nurse, writer and poet. Amateur and new writers are given a chance to prove themselves and get noticed. The Nebraska based publisher focuses on fiction, non-fiction, music, poetry, design and photography. You can send your manuscript after reading the guidelines mentioned on this page. From 1962, A-R Editions have been pioneering books on music and music history. The founders of the press Gary Aamodt and Clyde Rykken wanted to provide authors a safe haven for their stories. Musicians, researchers and educators could focus on their music, history and discuss the evolution of musical styles over the decades. An expert panel of professionals sifts through volumes of materials that authors submit and send for consideration. They have partnered with prestigious universities through the years to publish educational materials. In 1967, Yale University invited them to work on a European musicologist’s work. Located in Wisconsin, they print for themselves as well as assisting other institutes in research projects or music materials. You can find submission guidelines for different series on this page along with contact details. ECS Publishing is a part of a group that includes several music companies and musical imprints. ECS is primarily a music publisher that prints books and teaching guides for various instruments. Writers of choir music or sheets work with them to let the audiences learn music at home. They also print guides or guidebooks about musical terms, innovation and education for interested readers. If you are a writer of music and wish to submit a manuscript then you can send yours for consideration. The instructions and contact details for the Massachusetts based publisher are mentioned on this page. The popular and renowned guitar player Mel Bay founded Mel Bay Publications to teach the world music and instruments. His skills with the guitar made him a sought after writer and teacher. He taught music in St Louis and knew that his calling was a music educator. He has received several awards and commendations from institutions and organizations. The success of his skill was so wide that St Louis celebrates a ‘Mel Bay Day’ every year! After his death in 1997, the company continued to focus on nurturing musical and literary talent. Instrumental guide books, reference books, theory and anthologies about music are some of the things they publish. For interested authors and writers, you can write a short mail to the publisher describing your project and what sets it apart. The company is based in Fenton, Missouri. Since 1974, Kensington remains a successful and popular publisher in the American market. An independent publisher run by a family it has printed bestselling authors and novels in fiction and non-fiction. With a backlist of a staggering 3000 titles, it remains a prolific publisher who can spot literary talent in an instant. It has continued to push and encourage new, fresh writers who have a vital story to tell. They have several imprints and divisions that work on almost every genre that you can think of. Writers of fiction, contemporary fiction, romance, mystery, thriller, non-fiction, culture, art, music, memoirs, pop culture, business and lifestyle can send their manuscripts to be reviewed. You should only email the editor who is responsible for the genre you are working on. The details, names and addresses can be found on this page along with their chosen genres. Whether you are a debut author or a previously published writer, BenBella believes in supporting and marketing your book with equal fervor. They love working with experts, professionals or experienced artists who want to share a story. Your passion and energy must be clear and evident from your writing, your words and your story. They are fearless and will work in any genre as long as the story is appealing and intriguing. Anybody who has a journey to narrate in their chosen field can work with this publisher. In the business since 2001, they print only non-fiction. Non-fiction that resonates because it brings a tinge of reality and truth with it. Professionals, experts, marketers, musicians, artists, writers and authors of pop culture and business should approach BenBella. The rules to submit a manuscript are explained on this page along with other instructions. Since 1973, Chicago Review Press has been at the forefront of seeking promising voices in literature and writing. Curt Matthews and Linda Matthews launched the press to give new writers a home for their stories. Both the founders were teachers and they had the knack to find and support talent where they saw it. Writers of non-fiction, cooking, music, history, travel; film, science, culture, children’s non-fiction and education have been working with them for the last 40 years. They have flourished under the banner and been appreciated for their storytelling, nuanced writing and research. If you chose to work with them, you get a committed team of editors, designers, marketers and managers who will ensure you have a great and positive creative experience. They are only accepting non-fiction at this time. The submission guidelines and contact details can be found on this page. For anyone interested in becoming an artist or a creative professional, reading a well researched book with answers could be a lifesaver. That’s what Allworth Press aims to do. Collaborating with experts, former artists, professionals, educators, teachers and researchers in various fields, they compile a well written, solidly researched book. An imprint of Skyhorse Publishing, they have covered a wide range of subjects that provide basic to advanced level of knowledge and understanding to readers. These books are often respected and beloved by industry professionals because they deal with real issues faced by people in the particular field. The genres they work on include business, art, design, performing arts, culture, music, theater, relationships, photography and crafts. The submission guidelines and email address are available on this page for anyone interested in submitting a query or proposal. Very few publishers dare to take on controversial subjects or unconventional perspectives on typical subjects and genres. Barricade Books has been taking risks on edgy, unheard topics since 1992. The independent publisher is unique in the age of big publishers who want mass selling books that are easy and don’t step on toes. Authors or writers who are new or previously published get the same treatment and they encourage testing boundaries. A non-fiction publisher they prefer you send a manuscript through a literary agency but unsolicited manuscripts are also considered. There is no genre or story they won’t try experimenting with. The New York based agency accepts submissions via post or email. Send 1,000 words or 2 chapters from your manuscript in a PDF or Word file. An independent publisher that believes in the alternative positive energy instead of materialistic and conventional values, Hohm Press is located in Arizona. They strive to publish and print stories and books that encourage compassion, positivity, spirituality, nature and clean health while avoiding toxic behaviors or energy. Genres they love to work on include art, poetry, music, culture, spirituality, religious studies, health and parenting. If you have a story to tell or idea to share, send a query letter instead of a manuscript via post. A well written book should expand your horizon and broaden your perspective. Deirdre Greene and Nigel Quinney launched Roaring Forties Press with this goal in mind. Smartly designed books that encapsulate the story in a stylish, sleek manner and take you on a journey are what they seek. The independent publisher chooses to publish only non-fiction that makes you question the status quo and delve into issues in a much deeper manner. Based in Berkeley, they are currently accepting submissions. Writers of travel, contemporary non-fiction, art, music, biographies, non-fiction and investigative reporting can send their manuscripts for consideration. Send a book proposal, author bio, detailed marketing plan, table of contents and brief synopsis via email. From 2001, Haymarket Books has committed itself to printing and publishing books that contribute to social change. Books that analyze our past, present and future allow readers a window into the reality of the world around them. Having published almost 500 titles, they have worked with the sharpest minds of our generation such as Arundhati Roy, Noam Chomsky, Naomi Klein and Howard Zinn. They are always looking for books that empower, educate and awaken the minds of our readers. The non-profit, independent publisher is situated in Chicago. They want ideas and stories that can be radical, social, political and also work as academic reading or materials. Some of the topics and genres they have previously worked on include art, education, politics, black politics, music, cinema, culture, photography, memoir, poetry, police, feminism, history, sports and literature. If you wish to submit a query or a proposal, do read the guidelines and details mentioned on this page. The non-profit, independent New York based publisher has been known in the country for its thought provoking work. Ever since its establishment in 1992, it has persisted in finding offbeat, radical ideas and been an activist press. The New Press is a huge supporter of minority writers and giving them a platform to share their narrative. Using books and well researched facts as their base, they want to open discussions among the citizens of US and engage them in intelligent, useful debates. The authors along with their books have been noticed and won several awards for their integrity and excellence. They try to push the envelope by experimenting with design, styles and formats. Previously published genres include economics, politics, gender studies, LGBTQ studies, feminism, politics, history, art, culture, music, media, Latin America, human rights, religion and current affairs. You can use their online form to submit a book proposal. Do you know of any other music book publishing companies? Please tell us about them in the comments box below!